by Chris Woodford. Last updated: October 21, 2018. Is there anything better than a fresh, juicy omelet served piping hot? Is there anything worse than the frazzled remains of burnt egg that's stuck to the pan and just won't budge? If your cooking's as clumsy as mine, your favorite frying pan is made of a slippery material called PTFE (sold by Chemours™ under the brand name Teflon®) that's virtually impossible for food to stick to. Like many other miracle materials, PFTE doesn't occur naturally: it has to be specially made in a chemical plant. Its discovery was a wonderful fluke—a laboratory accident that happened back in the 1930s. Since then, PTFE has been used on everything from waterproof clothing and Moon-landing spacesuits to replacement body parts and stadium roofs. Let's take a closer look at what it is and how it works. 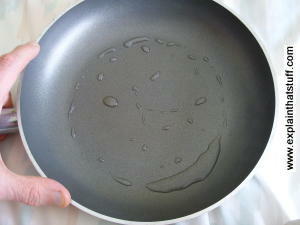 Photo: This nonstick pan is coated with a thin layer of DuPont's PTFE, better known as Teflon®. You can see how slippery a nonstick pan is if you pour a little water into it and rock it back and forth. Notice how the water barely wets the surface of the pan? That's because the cohesive forces holding the water molecules together into droplets are far greater than the tiny adhesive forces between the water molecules and the nonstick surface. Empty the water out and you'll find the pan is practically dry to the touch straight away. What makes an egg stick to a pan? If the pan is old and well used, chances are you've washed it hundreds of times, probably with a pan scourer or scrubbing brush. Every time you clean the metal surface, you scratch it slightly. The scratches make the surface rougher and, ironically, make it even easier for eggs to stick to its surface. It's probably true to say that the more you scrub the pan, the more you'll have to scrub it next time. It's a horrible vicious circle! Photo: 1) Routinely cleaning an ordinary steel plan like this scratches it and makes food even more likely to stick. 2) From a distance the pan looks clean and shiny, but in this digitally enhanced closeup photo, you can see how very badly scratched it is. Why is a rough surface easier for an egg to stick to? Think of rock climbers hauling themselves up the vertical face of a cliff. It's the scratches, bumps, and holes that make it possible to climb straight upward: if the cliff were perfectly smooth, climbing would be impossible. Why don't things stick to a nonstick pan? Artwork: The structure of PTFE. The blue blobs are carbon atoms; the red blobs are fluorine. A carbon atom can make bonds (links) to as many as four other atoms. In PTFE, each carbon atom is connected to two other carbon atoms with two fluorine atoms above and below. This is the basic repeating unit (chain link) or "monomer" in the polymer PTFE. PTFE is chemistry's equivalent of an introvert. It likes its own company, but it doesn't like other molecules all that much. Put a load of PTFE molecules together and they clump and stick together like spaghetti. In physics terms, we say there are strong cohesive forces between them. When you see a drop of rain sticking to a pane of glass, hanging in mid-air like a climber on a cliff, what you're seeing is cohesive forces in action. There are strong forces of attraction inside the water tugging its molecules inwards into the shape of a drop. But you're also seeing another kind of force too. There are adhesive forces holding the water molecules to the molecules in the glass. These are called van der Waals forces (pronounced: 'van dur varls') forces, named for the Dutch physicist Johannes Diderik van der Waals (1837–1923) who discovered them (and earned himself a Nobel Prize in the process). On the microscopic scale, van der Waals forces are what cause friction. Imagine a legion of invisibly tiny fingers helping the water molecules cling to the glass. That's what van der Waals forces are like. Photo: Sometimes rough surfaces are very handy. 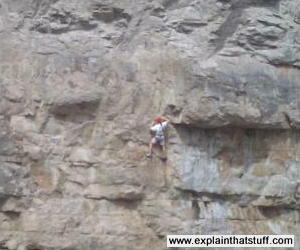 Rock climbers certainly couldn't climb a cliff coated with Teflon®! In PTFE, the cohesive forces are strong, but there are virtually no adhesive, van der Waals forces between the PTFE polymer molecules and anything that comes into contact with them. 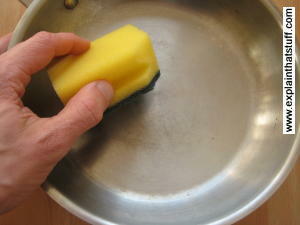 Try putting a single drop of water on a nonstick pan. Now turn the pan vertically so the drop has to cling like a climber on a cliff. How long does it stay there? No time at all: it cannot stick to the surface because the weight of the water is many times greater than the frictional, van der Waals forces—so the drop screeches immediately to the bottom of the pan. And notice that it doesn't smear like a raindrop falling down glass. The frictional forces are so low that it stays as a drop as it falls. It's still a drop when it gets to the bottom. What makes Teflon stick to the pan? This raises an obvious question. If you want to make a nonstick frying pan, and you have a lump of round metal in one hand and a splodge of slippery PTFE in the other, how do you get the two to stick together? How do you get the nonstick surface to stick to the pan? It turns out that you have to make the pan super-rough to start with by blasting it with grit. If the pan is extremely rough, the PTFE will bind to it like a rock climber clinging to the face of a cliff. Then you just bake the pan in a really hot oven and the PTFE will permanently lock itself to the metal underneath. Job done. Two-stage power-spray wash and rinse: The uncoated aluminum pans ("aluminum blanks") are sprayed with a mild alkaline cleaner using a high-pressure hose, then sprayed again with high-pressure hot water. This initial step removes oil and dirt so the blanks are perfectly clean and ready for blasting. 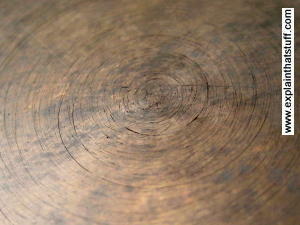 Rinse and dry: The blanks are rinsed with hot water and air dried to prevent any marking. Grit blasting: Hard, sharp iron grit is blasted across the aluminum to roughen its surface, using a centrifuge to disperse it evenly. Air blasting: This step removes any loose grit. Washing and rinsing: This step is very similar to the initial two-step cleaning process (stage 1), using the same mild alkaline cleaner, followed by a hot-water rinse. Deoxidation cleaning: Acids and other cleaning agents restore the bright and shiny appearance of the aluminum. Drying and Teflon coating: Once the blanks are dry, they're coated with Teflon by spraying, brushing, or flowing it across their surface, then air dried. Sintering: The Teflon coating is "baked" onto the pan at a temperature of around 370–385°C (700–725°F) for about five minutes. What is PTFE used for? Photo: Many buildings have Teflon-coated roofs. 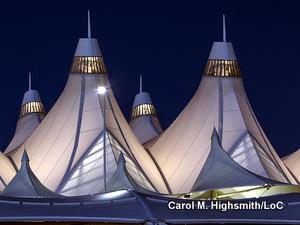 This is the tent-like roof of Denver International Airport in Denver, Colorado, United States. Detail of a photo by Carol M. Highsmith courtesy of Gates Frontiers Fund Colorado Collection within the Carol M. Highsmith Archive, Library of Congress, Prints and Photographs Division. PTFE's not just in your frying pan—you can find it in all kinds of unexpected places. The world's biggest dome building, London's once-controversial Millennium Dome (now called the O2 Arena), has a huge white tent roof made out of PTFE-coated fiberglass to keep the rain off. PTFE is also used in bionic body parts such as replacement hips, where the artificial joint is made from a strong and lightweight titanium or steel ball that swivels effortlessly inside a PTFE socket. The very same chemical that's lubricating your legs could be keeping you clean and dry too. Clothing fabrics are often treated with a PTFE-based stain repellent to keep oil, grease, and stains at bay. Since PTFE is a plastic, it repels water, so you'll often find it on umbrellas and wet-weather clothes. What works for soft textiles works just as well on hard buildings; PTFE additives are also used in wipe-clean paints and woodcare products. 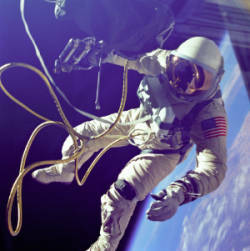 Photo: Teflon® was used in space suits like this, but it wasn't invented during the space program. Ed White, the first American spacewalking astronaut, relied heavily on protective materials in his suit and helmet. Photo courtesy of NASA on the Commons. Many people think PTFE was invented as part of the 1960s Apollo space program, but it actually dates back to 1938. That was when DuPont™ chemist Roy Plunkett (1910–1944) made some PTFE completely by accident when an experiment he was doing on refrigerator chemicals went badly wrong. Like many of the word's best inventions, PTFE started life as a hopeless mistake—a glob of white goo no-one knew what to do with. It wasn't until the 1940s and 1950s that nonstick "Teflon®," as DuPont called it, really took off as a low-friction coating. During the 1960s, NASA's space scientists realized that PTFE, which has high resistance to heat, doesn't react with other chemicals, and is slippery enough not to cause abrasion, was a perfect protective material to use inside space suits. Thus was born the myth of PTFE as a spinoff from the space program. Truth is, PTFE was invented over 30 years before astronauts went anywhere near the Moon! Adhesives (glues): What if you want things to stick? GORE-TEX®: An alternative use for PTFE. Lubricants: Friction-reducing chemicals used in engines and other machines. Teflon®: Official Chemours website. Explains the many different uses for Teflon and goes into some detail to explain why "...Teflon® nonstick coatings are safe for consumer use." The Lawyer Who Became DuPont's Worst Nightmare by Nathaniel Rich, The New York Times, 6 January 2016 and The Teflon Toxin by Sharon Lerner, The Intercept, 11 August July 2015. Two detailed articles investigating the potentially harmful effects of Teflon and chemicals used in its manufacture. Material of the month—Teflon by Anna Ploszajski. Materials World, Feb 1, 2015. A great introduction to how Teflon was developed and how it's become an indispensable modern material. A non-stick panacea by Tim Hayward, The Guardian, 2 July 2010. A food writer asks whether cooks really need to use nonstick pans. 'Virtually non-stick' gum created by Rebecca Morelle and Liz Seward, BBC News, 13 September 2007. Is it possible to make an environmentally friendly chewing gum that doesn't mess up our streets? Frying pan fumes 'kill canaries' by Alex Kirby, BBC News, 29 January 2004. Are household chemicals killing our favorite birds? Teflon's sticky situation by Chris Summers, BBC News, 7 October 2004. Do chemicals used in PTFE manufacture cause cancer? Science plans 'non-stick' submarine: BBC News, 10 October 2003. How scientists are using nanotechnology coatings to make materials that are even slippier than Teflon. US Patent 2,230,654: Tetrafluoroethylene polymers by Roy J Plunkett, Kinetic Chemicals Inc, 4 February 1941. This is Roy Plunkett's original Teflon patent. Although short on details, it describes the chemical composition of PTFE. US Patent 2,401,897: Preparation of tetrafluoroethylene by Anthony F Benning, Frederick B Downing, and Roy J Plunkett, Kinetic Chemicals Inc, 11 June 1946. This follow-up patent goes into more detail about the practical preparation of PTFE. US Patent 3,243,321: Method of Teflon coating of metals by Ronald P Rowand, Atlas Copco, 29 March 1966. How do you get Teflon to stick to a pan? This patent explains the process by which aluminum cooking pan blanks are nonstick coated with Teflon. "Teflon" and "Chemours" are registered trademarks	of The Chemours Company. "DuPont" is a registered trademark of E. I. du Pont de Nemours and Company.